The update brings support for the company's Intune mobile application management solution and a Conditional Access feature that requires users enroll in mobile device management before getting their Office 365 email through Outlook. Administrators can deploy the Outlook app to devices that are enrolled in a company's Intune system, and then manage them under a custom policy. That policy can include a variety of limitations, like preventing users from copying corporate email content to applications or other email accounts that aren't managed by the company and encrypting data from the Outlook app. At the same time, the profile can be set up so that personal email accounts added to the Outlook app aren't managed under corporate policy. Outlook for iOS and Android will also support Intune's selective wipe capabilities. That means administrators who want to remove corporate data from a personal device (like when an employee leaves a company with the phone they brought in) can do so without also obliterating a user's personal email and calendar information. With the Conditional Access system, users who attempt to log in to their Exchange Online email account from a device that isn't being managed by Intune, will be prompted to enroll the device in Microsoft's mobile device management system before they can get access to their email. Once enrolled, they won't be able to log in to their email until their device complies with all of the policies laid out in Intune like having a passcode set. The rejection message will link users to an Intune page that explains what they have to do before they can get access to all of their email. These features were first announced at Microsoft's Ignite conference last month, and provide enterprise IT administrators with a way to better control users who bring their own devices to work. 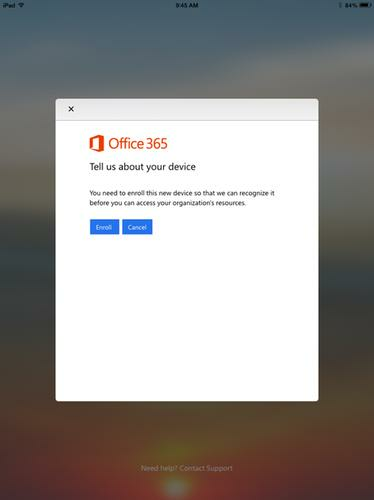 The news comes a week after Microsoft rolled out a new authentication method for Office 365 that's key to the capabilities rolled out Thursday. All of this was made possible by Microsoft's acquisition of Acompli in late 2014. That purchase allowed the tech titan to take Acompli's email app (which bore the same name) and turn it into the new Outlook app for iOS and Android. Microsoft has made a couple of additional acquisitions in the cross-platform productivity space this year with the purchase of calendar app maker Sunrise Atelier and to-do list app company 6Wunderkinder.